QSM11 diesel engines, each delivering 602 Bhp at 2300 rpm and a top speed of 25 knots. A Humphree intercep- tor, with automatic trim optimization, is installed at the transom. Diesel capacity is 690 gallons, which, shipyard of? cials say, will provide a range of at least 350 miles at an economical speed of about 20 knots. The wheelhouse, ? ush-mounted to the deck amidships and with forward- leaning front windows, is out? tted with Llebroc seats and a settee and is heated by two Heatercraft 40,000 Btu units. The forecastle also includes a 40,000 Btu heater, along with a settee, portable head, and built-in storage cabinets. Gladding-Hearn Shipbuilding, Duclos Corporation. 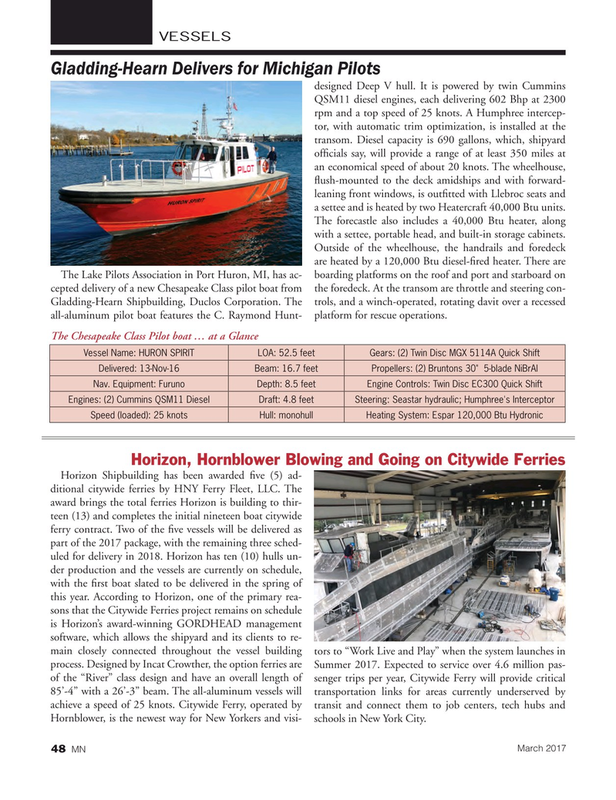 The trols, and a winch-operated, rotating davit over a recessed all-aluminum pilot boat features the C. Raymond Hunt- platform for rescue operations. Hornblower, is the newest way for New Yorkers and visi- schools in New York City.